Ordered Universe members undertake a wide variety of activities open to the public. 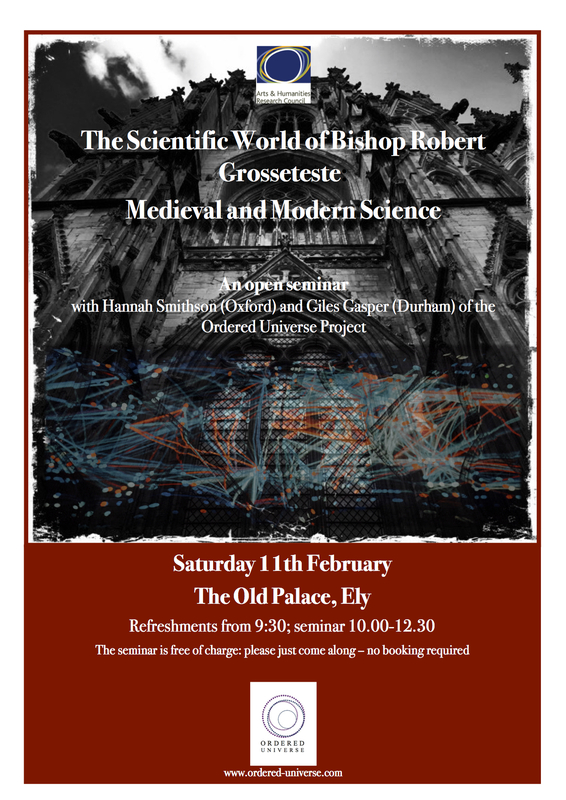 The Project itself has a series of public lectures attached to the research symposia programme, and a series of public forums (longer format events with public readings and analysis of Grosseteste’s works). In addition we take part in other events, as invited participants, and as part of Festivals. If you would like to attend we’d love to meet you and see you at our events. The short films by Alan Fentiman give an excellent flavour of what to expect! 23 March 2019, 14.00–19.00, ‘A Symposium on Colour Through Time: “Sonnebemes and Raynebowes”‘ at the Royal College of Art, Kensington, London, UK. Speakers and Conversation 14.00–18.00, Reception 18.00–19.00. Professor Tom McLeish, York Chair of Natural Philosophy was invited to speak at a symposium at the Royal College of Art in Kensington as part of The Blyth Gallery exhibition for Mres SOAH at the RCA. The exibition was inspired by Bartholomeus Anglicus’ De Iride and was curated by Degard. Tom gave a paper titled ‘Grosseteste’s De Colore and De Iride: Using Medieval Theories of Colour to Stimulate New Science’ and was able to bring his Ordered Universe Project background to bear on Bartholomeus Anglicanus’ treaty and colour theory through history. The poster for the event can be seen below. Dr Nicola Polloni (Humboldt University, Berlin) came to Durham on Tuesday 5 March to give a lunchtime talk entitled: ‘Looking into the unknowable: premodern conundrums of Prime Matter”. The talk was hosted by the Ordered Universe Project and took place in SR2 in the Department of History from 12–1pm. Dr Polloni’s research explores the reception and impact of Classical and Arabic scientific treatises in medieval western Europe and anyone interested in medieval alchemy, astronomy, philosophy, and the natural sciences was particularly encouraged to attend. The poster for the event is below. An introduction to the Ordered Universe project, its blend of medieval studies and modern science, the scope and range of its subject – the scientific writings of Robert Grosseteste – and excitement and dynamic of collaborating across disciplinary frontiers. This will be followed by a talk about, and demonstration of, the tools of medieval starcraft, the astrolabe in particular. With examples from the Middle Ages of practice in, and beyond, the universities the talk will open up a different world, and a different way of looking at the night skies. Ordered Universe team members will be participating in a wide variety of activities, talks, and demonstrations at the Napa Lighted Festival under the theme of Beyond. This will feature a new show by Ross Ashton and Karen Monid, Horizon, which takes its inspiration from Grosseteste’s treatises on cosmology and place. The team members at Napa are: Brian Tanner, Giles Gasper, Alexandra Carr, Colin Rennie, Cate Watkinson, Josh Harvey, Luke Fidler and Henrike Lange, with restauranteur Andy Hook from Blackfriars Restaurant, Newcastle upon Tyne. An exciting Hack Day organised by Creative Fuse to investigate, experiment with, and modify a new artwork by Cate Wilkinson and Colin Rennie. The artwork, Colour Field, is a large interactive LED wall, which will be on display at Sunderland Fab Lab especially for this event (previously displayed at the National Glass Centre). Showing nightly over the course of the Cambridge e-Luminate Festival for 2018, the latest projection from The Projection Studio in collaboration with the Ordered Universe Research Project. The show investigates, colour, perception and how humans process and understand the world around us. The Guildhall, Cambridge 15:00-17.00 – Ordered Universe presents a series of short talks, q&a and interactive activities, with artistic exhibition, and in support of ‘I see’, a new projection from The Projection Studio. 17.00-18.15 demonstrations of how to make a rainbow, how to use an astrolabe and a poster display on the life and scientific works of Robert Grosseteste. and original artwork and photographs from Rosie Reed Gold (featuring images from the Illuminating Colour exhibition at the National Glass Centre), and Alexandra Carr. Featuring a new sculpture by Alexandra Carr, Empyrean, this exhibition explored the world of Dante’s Divine Comedy, through texts, manuscripts, images and artwork. Curated by Dr Annalise Cippollone, the exhibition opens on December 2nd (an admission charge will apply). Alexandra’s sculpture forms the centrepiece of the section dedicated to Paradise. The exhibition provides an opportunity to explore the relationship between colour, light and glass. Robert Grosseteste (Bishop of Lincoln 1235–1253) has been described as ‘The greatest mind you’ve never heard of’. Scientists, historians and artists from the Universities of Oxford, Durham and Sunderland have worked together to explore Grosseteste’s theories on light and colour culminating in this exhibition of new work created by Cate Watkinson and Colin Rennie. Artworks creating colour using only glass and light are shown alongside others using digital technology, allowing visitors to interact with and alter the nature of the works. A showing by the Projection Studio of Spiritus: Light and Dark inspired by the Ordered Universe project, on the Museum of Natural History in Oxford. Part of the Night of Heritage Light, the presentation is free and open to the public. – – a joint lecture with the Sculpting with Light Project (Leverhulme Trust Artist in Residence), the Department of Italian – School of Modern Languages and Cultures, Durham University and Ushaw College. Free and open to the public. Show and Tell from the Sculpting with Light project (Leverhulme Trust Artist in Residence) – come and find out about medieval and modern cosmology, including Grosseteste, and how they inspire contemporary art, and how that in turn elucidates the subjects. Free and open to the public. – a joint lecture with the Sculpting with Light project (Leverhulme Trust Artist in Residence) and Ushaw College. Free and open to the public. Medieval and Modern Cosmology with Alexandra Carr, Dr Giles Gasper, Dr Mark Neyrinck (part of the Leverhulme Trust funded artist in residence programme – Sculpting with Light). Exhibiting and participating at the ASMbly Lab, organised by The Superposition. Part of Pint of Science – Analysing Antiquity. Ordered Universe presents Let There Be Light! Medieval and Modern Science on Light. 15.00-17.00: Ross Ashton, Richard Bower, Hannah Smithson, Giles Gasper and Tom McLeish present a series of short talks to support the Cambridge e-Luminate Festival, and the new projection from Ross Ashton and Karen Monid Spiritus – Light and Dark. 17.00-19.30: Interactive activities and poster display from Ordered Universe, on project research and Medieval and Modern Science – with Sebastian Falk, Girton College, University of Cambridge on Astrolabes, as well as modern galaxy modelling, human vision and perception, medieval universe modelling and the life and times of Robert Grosseteste, and his scientific treatises. ‘Heaven’s Above!’: Interactive Exhibition – Medieval and Modern visions of the cosmos, with hands-on activities and mini-talks. Professor Tom McLeish, ‘Towards a theology of science – what is science for?’, including a section on Robert Grosseteste. Tom McLeish took part in an evening panel discussion on ‘Science and Spirituality’, using the Ordered Universe projects a key example. 18.00, Notre Dame Global Gateway, Via Ostilia 15, Rome. Free and open to the public. Tom McLeish gave a talk to Sixth Form Students at Sevenoaks School in Kent entitled ‘Learning from Medieval Scientist: An Interdisciplinary Investigation’. Friday 29th January 2016: Durham University Physics Society, Senate Suite, Durham University. Saturday 21st November, 2015: Durham Cathedral, Haydn’s Creation, Concert, The Durham Singers and Ensemble, 7.30 pm. A free public lecture on the science and history behind the World Machine, the centrepiece of Durham Lumiere 2015. 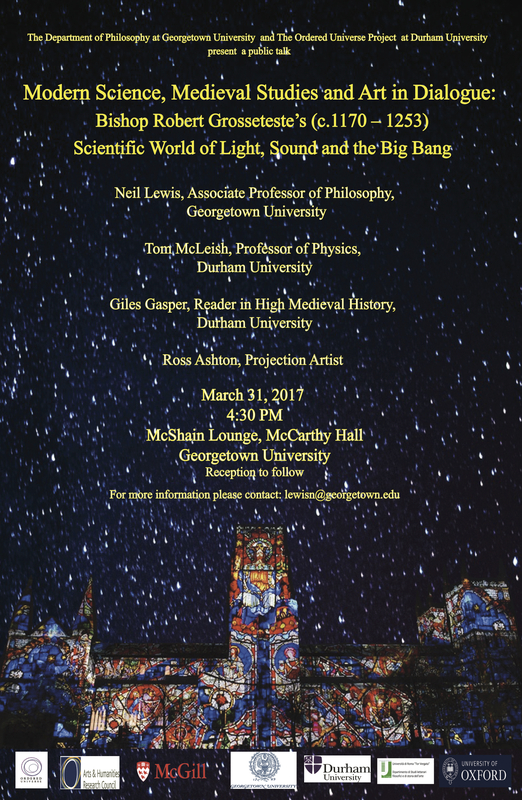 ‘The music of light: public workshop and poster exhibition’ showcases research into understandings of light from the middle ages to modern science. Participants can explore the creation of colours, send messages along a light beam and experience a simulation of light being bent by the gravity of their own bodies. Alongside modern science, historical understandings of light will be presented, especially the world of Robert Grosseteste (d.1253). This features the work of the Ordered Universe Research Project (www.ordered- universe.com), whose members will be on hand to explain the richness of collaboration between medievalists and modern scientists. The event is supported by the Institute of Physics. The workshop and exhibition is followed by an hour long concert given by the Durham Singers on the theme of light. ‘The Music of Light‘ will feature works from the Renaissance to the modern-day including a piece by Durham-based composer Janet Graham. Free, ticketed, events: tickets from World Heritage Visitor Centre. Ordered Universe research into the medieval cosmos features as part of the main sound and light installation for Durham Lumiere 2015 ‘The World Machine’. Created in collaboration with designers and projectionist Ross Ashton, composer Isobel Waller-Bridge and sound designer John Del’Nero, the show was the brainchild of Carlos Frenk, Director of the Durham Institute of Computational Cosmology. He and Richard Bower have masterminded production of films from the EAGLE Galaxy Modelling project, and astronomical images of the universe, together with a team of devoted cosmologists. Richard and Giles Gasper helped curate the material for the medieval cosmos, using Ordered Universe research into the De luce, using the edition and translation by Cecilia Panti and Neil Lewis, as well as Giles and Faith Wallis’s project on the early 12th century Durham scientific compendium Hunter 100 (part of the Durham Priory Digitisation Project). The result will be an amazing display of the different perceptions and understandings of the universe in which we live. For more on the research behind the show see Inside the World Machine. The show itself is free, and runs every twenty minutes (dates and times above). Hannah and Giles will be presenting aspects of Grosseteste’s teaching and learning, including new work on the treatises on sound and the liberal arts, as part of a series of talks based on exciting new archaeological discoveries beneath the Westgate Shopping Centre. These include the Franciscan Friary established by Agnellus of Pisa in 1224, within Francis’s lifetime (d. 1226), to which community Grosseteste was appointed as their first lector. The Ordered Universe project is deeply honoured that Mike Huxtable, a founding member, has been asked to deliver the annual Grosseteste lecture. Mike, an expert on Middle English vernacular and medieval colour theory, will offer a series of reflections on Grosseteste’s majestic poem of redemption, written in Anglo-Norman French, the Chateau d’Amour: castles, rainbows, the fall and salvation of mankind. Monday 21st September, 2015: University of Otago, Dunedin, New Zealand: 2 Lectures by Tom McLeish. Tom will be talking in the University of Otago about the collaboration between humanities and science, as exemplified by the Ordered Universe project. Tom’s talk is jointly hosted by the University of Otago’s Centre for Theology and Public Issues, and the Division of Humanities and Division of Science. Join Brian and Giles as they explore the unified nature of Grosseteste’s scientific thought, from cosmology to the earth and its natural phenomena. The lecture is part of the Royal Society’s contribution to the Open House London weekend, which celebrates the city’s architecture and heritage, and the dynamic place of the buildings in modern life. The event is free to attend, tickets can be picked up on the day from the information desk, and doors open 15 minutes before the start of the lecture. Tom McLeish: ‘Working with Medieval Scholars on 13th Century Science Texts – A Scientist’s Tale’. Tom will talk about the Ordered Universe project from the perspective of modern science, how scientists’s can, and should, engage with the deeper roots of their subjects. In so doing an appreciation of the understanding of natural phenomena known by past thinkers can lead to new respect for their wisdom, and allow their examples to be a source of inspiration . A public lecture given by Tom on the nature and genesis of the Ordered Universe project: what happens when medievalists and scientists join forces to follow the thought of a 13th century genius. The event is jointly organised by the Monash Centre for Medieval & Renaissance Studies, The Institute for the Study of Christianity in an Age of Science and Technology, and the School of Philosophical & Historical Studies at The University of Melbourne. Robert Grosseteste: The Greatest Mind You’ve Never Heard Of..
Tom, Hannah and Giles, in conversation with Lord Winston, will present their favourite and exhilarating moments from the Ordered Universe and dwelling with Grosseteste and his scientistic works. A snip at £8 in the Helix Theatre. 18th-19th November 2014: ‘From the Dark Ages to Dark Matter: Modern Encounters with Medieval Science‘: a day-long public workshop on the 18th November as part of the Being Human, Festival of Humanities, in Durham Cathedral, introducing the public to Grosseteste and the treatises on colour, light, the rainbow and the generation of sounds. The day culminated with the first public showing of the visualisation, in the chapter house at Durham. The 19th November featured a Public Lecture as part of the Durham University, Centre for Catholic Studies, Ushaw Lecture Series, by Michael Brooks, well known popular science author. The activities were funded by the Festival of Humanities and the Institute of Advanced Study, Durham University.